How’s this for playing against stereotype? Keith Ellison, who has long battled to escape the fallout from his long-ago defense of Jew-baiting Nation of Islam leader Louis Farrakhan, first emerged on the political scene 30 years ago—fighting anti-Semitism. “I would do it again today,” Ellison said during an hourlong June 29 interview at a University Avenue coffee shop in St. Paul. It was 1988 and Ellison was leading the University of Minnesota’s Black Law Students Association. After weeks of administrative inaction, he helped organize a kind of counter-vandalism protest in which progressive students spray-painted over anti-Jewish messages that bigots scrawled onto the campus’ Washington Avenue bridge. Ellison said he doesn’t remember lifting a spray can that day. But contemporary newspaper accounts have him stepping forward to defend three youths arrested for vandalism. The nation’s first Muslim congressman is abandoning one of the nation’s safest seats to risk all in a run for state attorney general. Ellison grew up in Detroit as the Catholic son of a psychiatrist father and a social worker mother; three of his four brothers became lawyers. He converted to Islam as an undergrad at Wayne State University before coming to Minnesota in 1987 to study law. In that article, he acknowledged defending Farrakhan in print shortly after 1995’s Million Man March, which Farrakhan helped organize. At the time, he felt the march’s message of empowering young African-Americans was under attack. What Ellison never has renounced is his advocacy for the poor and underserved. As a third-year law student in 1989, he was spokesman for the Ad Hoc Committee Against Police Brutality, a group that spearheaded creation of a police Civilian Review Board. In 1997, he led The City Inc., a nonprofit advocacy group with a staff of about 200 that provided inner city Minneapolis kids with alternative schools. As a young attorney, he led the Legal Rights Center, a nonprofit that provides legal services to the poor. Launched by attorney Doug Hall and later led by Ellison’s mentor, the late Hennepin County Public Defender Billy McGee, it predated the statewide public defenders system. Ellison’s client list from those days is a who’s who of 1990s Minnesota notoriety—Kieran Knutson, Adrian Riley and former Vice Lords gang leader Sharif Willis among them. “I believe in the Sixth Amendment, right?” Ellison said with his customary emphasis. “Zealous” is a not a bad description for the 54-year-old. His progressive zeal has won him many devotees—and status as the consensus front-runner in the Aug. 14 DFL primary. But it also has been known to get him into trouble. In May 1992, after four cops were acquitted in the videotaped beating of motorist Rodney King, Ellison said publicly that black Americans do not live under a democracy. “You don’t have an obligation to obey a government that considers you to be less than human,” he said. But “the quest for democracy” is in his DNA, according to Ellison. He notes that one of his grandfathers spent the early 1950s organizing rural black voters in Louisiana—risky business in the old Deep South. “I was born to circumstances where I always knew that people like me had to struggle for democracy,” he said. By his 30s, he was deeply engaged. In 2003, he got elected and served two terms as a state representative. While there, he was known mostly for his work ethic—he reportedly authored more bills than any other DFLer during the period. He was not then regarded as particularly divisive. That changed when he ran for Congress in 2006. His Republican opponent, Alan Fine, went so far as to proclaim himself “offended as a Jew” by Ellison’s candidacy. He won anyway, outpolling both Fine and independent candidate Tammy Lee with 56 percent of the vote. His home district voters have never seemed too troubled; Ellison couldn’t be in a safer seat. Still his door-knocking campaigns are almost legendary. In a three-month period in mid-2017 when he was running for reelection to Congress, he said his campaign workers knocked on 50,000 doors. On June 27 and 28, well after he had launched his AG bid, his campaign made 1,303 constituent calls, engaging with 181 people—a hit rate of 14 percent. Their top issues were immigration, consumer protection and education. Ellison says he has always campaigned like he is in a tight race because he has his eyes on a larger prize—DFL dominance. Ellison, who retains his spot as DNC deputy chair, puts social and economic justice at the top of his AG priority list. That means fighting wage theft and consumer fraud and protecting seniors, he said. It means making sure polluters are held to account. It means pushing back against predatory student loan services to make education affordable. It means enforcing Minnesota’s anti-trust laws to fight monopolization. A new wrinkle he intends to introduce to the job is a series of AG community meetings, not unlike congressional town halls. Those gatherings always generate great ideas and allow staff to deal directly with constituent problems, he said. Among DFLers, Ellison’s AG campaign is easily the most machine-like. Reporters are deluged daily with Ellison campaign emails from his chief campaign spokesman, Sam Fettig, a transplant from Gov. Mark Dayton’s communications team. Dayton himself offered Ellison his nearly immediate endorsement. In fact, Ellison has loads of endorsements. Former Vice President Walter Mondale—a one-time Minnesota attorney general—is one. Bernie Sanders, the 2016 presidential candidate who landed Ellison as an early supporter, has reciprocated and plans to rally with Ellison on Friday. Dozens of current local and state elected officials also are in Ellison’s corner, though they mostly are concentrated in Twin Cities metro. Therein lies a problem, potentially. Tom Foley, the former Ramsey County attorney who is running in the DFL primary, is among those who question Ellison’s outstate appeal and electability. “Electability is important in this race,” Foley has said. Ellison dismisses such talk. “Look, nobody turns out the vote like me,” he said. Ellison is not as openly dismissive of those who say he wants to become AG to mount a series of legal assaults on President Donald Trump’s policies. 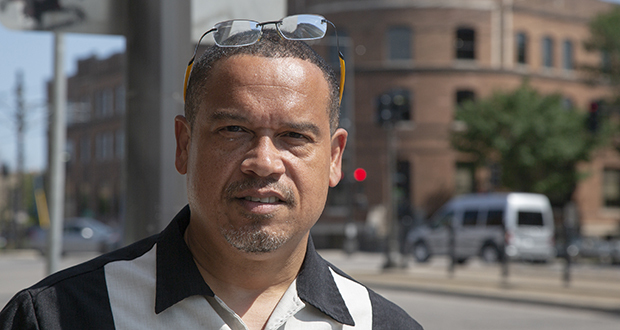 As his Minnesota Lawyer interview wrapped, Ellison was asked whether Minnesota—which, after his two decades in the spotlight now knows him well—has grown enough to accept him for who and what he is. Surprising fact: Before entering public service, Ellison hosted a public affairs radio program for a number of years. Notable facts: Ellison is both the first African-American from Minnesota ever elected to Congress. He also was the first Muslim ever elected to the U.S. Congress.